The Supreme Court did not allow itself to be converted into a khap panchayat, although it came close to it on Tuesday as it heard the Hadiya case. The counsel for the National Investigation Agency (NIA) supported by the legal counsel of the Central government made out a case of indoctrination and brainwashing in a conspiracy of ‘love jehad’ which they claimed rendered Hadiya incapacitated and invalidated her consent. The NIA wanted the court to study the documents it claimed it had as evidence before they heard Hadiya. For one and a half hours, this young woman stood in open court hearing arguments about herself, against herself and her chosen partner. It was shameful, humiliating and set an unfortunate precedent. If the court was not clear that it wanted to hear her, why did they call her at all? She should never have been subjected to that kind of indignity. She is not a criminal but she was treated like one for that period of time. The court remained undecided even in the face of the compelling argument by lawyers Kapil Sibal and Indira Jaising representing Hadiya’s husband Shafin Jahan that the most critical issue was that of the right of an adult woman to make her own choice. 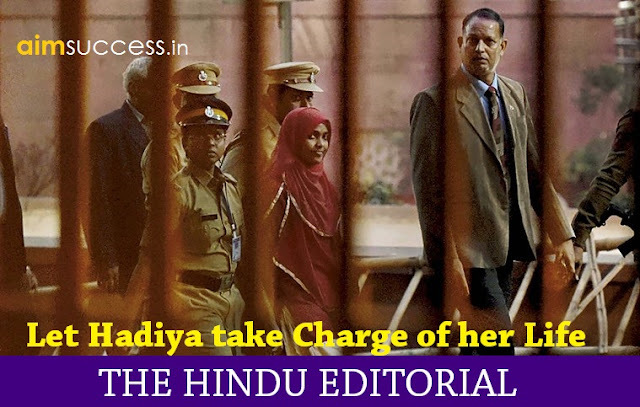 The court almost adjourned for the day when the Kerala State Women’s Commission lawyer, P. Dinesh, raised a voice of outrage that after all the accusations against Hadiya in the open court if the court did not hear her, it would be a grave miscarriage of justice. In khap panchayats, the woman accused of breaking the so-called honour code is never allowed to speak. Her sentence begins with her enforced silence and ends with whatever dreadful punishment is meted out to her by the khap. Fortunately the Supreme Court pulled itself back from the brink and agreed to give Hadiya an opportunity to speak. There was no ambiguityabout what she said. It was the courage of her conviction that stood out. She wanted to be treated as a human being. She wanted her faith to be respected. She wanted to study. She wanted to be with her husband. And most importantly, she wanted her freedom. The court listened, but did it hear? Both sides claim they are happy with the order. Hadiya and her husband feel vindicated because the court has ended her enforced custody by her father. She has got an opportunity to resume her studies. Lawyers representing the couple’s interests have explained that the first and main legal strategy was to ensure her liberty from custody which has been achieved. They say that the order places no restrictions on Hadiya meeting anyone she chooses to, including her husband. It is a state of interim relief. Her father claims victory because the court did not accept Hadiya’s request to leave the court with her husband. Instead the court directed that she go straight to a hostel in Salem to continue her studies. He asserted this will ensure that she is not with her husband who he has termed a terrorist. The next court hearing is in January and the way the court order is implemented will be clear by then. The case reveals how deeply the current climate created by sectarian ideologies based on a narrow reading of religious identity has pushed back women’s rights to autonomy as equal citizens. From the government to the courts, to the strengthening of conservative and regressive thinking and practice, it’s all out there in Hadiya’s case. One of the most disturbing fallouts is that the term ‘love jehad’ used by Hindutva zealots to target inter-faith marriages has been given legal recognition and respectability by the highest courts. An agency whose proclaimed mandate is to investigate offences related to terrorism has now expanded its mandate by order of the Supreme Court to unearthso-called conspiracies of Muslim men luring Hindu women into marriage and forcibly converting them with the aim of joining the Islamic State. The underlying assumption is that Hindu women who marry Muslims have no minds of their own. If they convert to Islam, that itself is proof enough of a conspiracy. This was clearly reflected in the regressive order of the Kerala High Court in May this year which annulled Hadiya’s marriage. Among other most objectionable comments it held that a woman of 24 is “weak and vulnerable”, that as per Indian tradition, the custody of an unmarried daughter is with the parents, until she is properly married.” Equally shocking, it ordered that nobody could meet her except her parents in whose custody she was placed. Courts in this country are expected to uphold the right of an adult woman to her choice of a partner. Women’s autonomy and equal citizenship rights flow from the constitutional framework, not from religious authority or tradition. The Kerala High Court judgement should be struck down by the apex court. We cannot afford to have such a judgment as legal precedent. The case also bring into focus the right to practice and propagate the religion of one’s choice under the Constitution. In Hadiya’s case she has made it clear time and again that she converted because of her belief in Islam. It is not a forcible conversion. Moreover she converted at least a year before her marriage. So the issue of ‘love jehad’ in any case is irrelevant and the court cannot interfere with her right to convert. As far as the NIA investigation is concerned, the Supreme Court has ordered that it should continue. The Kerala government gave an additional affidavit in October stating that “the investigation conducted so far by the Kerala police has not revealed any incident relating to commission of any scheduled offences to make a report to the Central government under Section 6 of the National Investigation Agency Act of 2008.” The State government said the police investigation was on when the Supreme Court directed the NIA to conduct an investigation into the case. It thus opposed the handing over of the case to the NIA. In the light of this clear stand of the Kerala government, it is inexplicable why its counsel in the Supreme Court should take a contrary stand in the hearing — this should be rectified at the earliest. The NIA is on a fishing expedition having already interrogated 89 such couples in Kerala. Instead of inter-caste and inter-community marriages being celebrated as symbols of India’s open and liberal approach, they are being treated as suspect. Now, every inter-faith couple will be vulnerable to attacks by gangs equivalent to the notorious gau rakshaks. This is not just applicable to cases where a Hindu woman marries a Muslim. There are bigots and fanatics in all communities. When a Muslim woman marries a Hindu, Muslim fundamentalist organisations like the Popular Front of India use violent means to prevent such marriages. Sworn enemies, such as those who belong to fundamentalist organisations in the name of this or that religion, have more in common with each other than they would care to admit. Hopefully the Supreme Court will act in a way which strengthens women’s rights unencumbered by subjective interpretations of tradition and communal readings of what constitutes national interest. Meaning: The process of teaching a person or group to accept a set of beliefs uncritically. Example: A conspiracy to destroy the government. Meaning: Submit or present for inspection or consideration. Example: He would render income tax returns at the end of the year. Example: No change may be made without the consent of all the partners. Meaning: Making someone feel ashamed and foolish by injuring their dignity and pride. Meaning: Put off or postpone (a resolution or sentence). Example: Sentence was adjourned for a social inquiry report. Meaning: Giving cause for alarm; serious. Example: A matter of grave concern. Meaning: The punishment assigned to a defendant found guilty by a court, or fixed by law for a particular offence. Example: Her husband is serving a three-year sentence for fraud. Meaning: Causing or involving great suffering, fear, or unhappiness; extremely bad or serious. Example: There’s been a dreadful accident. Meaning: Dispense or allot justice, a punishment, or harsh treatment. Example: He denounced the maltreatment meted out to minorities. Example: The country was on the brink of a constitutional crisis. Meaning: Show or prove to be right, reasonable, or justified. Example: More sober views were vindicated by events. Meaning: The power or scope to act as one pleases. Example: Individuals should enjoy the liberty to pursue their own preferences. Meaning: In or for the intervening period; provisional. Meaning: Rigidly following the doctrines of a sect or other group. Example: The sectarian Bolshevism advocated by Moscow. Example: The ideology of republicanism. Meaning: Returning to a former or less developed state; characterized by regression. Example: Regressive aspects of recent local government reform. Meaning: The adverse results of a situation or action. Example: He’s prepared to take calculated risks regardless of political fallout. Meaning: Declare officially or publicly to be. Example: He proclaimed King James II as King of England. Meaning: Find (something) in the ground by digging. Example: Workmen unearthed an ancient artillery shell. Meaning: Tempt (a person or animal) to do something or to go somewhere, especially by offering some form of reward. Example: The child was lured into a car but managed to escape. Meaning: Using force or violence. Example: No one will be forcibly evicted. Example: The villagers are concerned about burglaries. Meaning: A written statement confirmed by oath or affirmation, for use as evidence in court. Example: A former employee swore an affidavit relating to his claim for unfair dismissal. Example: An expedition to the jungles of the Orinoco. Meaning: Famous or well known, typically for some bad quality or deed. Example: Los Angeles is notorious for its smog. Meaning: A person filled with excessive and single-minded zeal, especially for an extreme religious or political cause. Meaning: Make a solemn statement or promise undertaking to do something or affirming that something is the case. Example: Maria made me swear I would never tell anyone. Meaning: Not having any burden or impediment. Example: He needed to travel light and unencumbered.